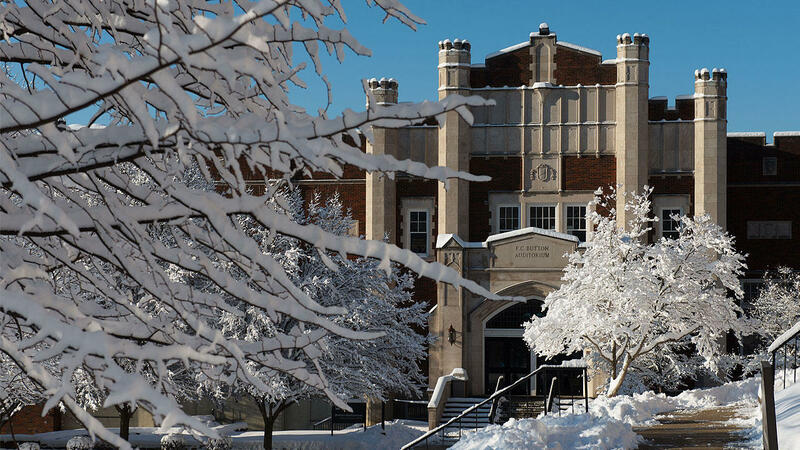 Morehead State University will be closed Dec. 19 through Jan. 1 for winter break. There will be no classes, dining and residence halls will be closed, and administrative offices will be closed during the break. The University will reopen on Wednesday, Jan. 2, 2019. Students return to class for the spring semester on Monday, Jan. 14. Recreation and Wellness Center: Outdoor Adventures and the bowling lanes will be closed for the entire break. The Center will be close on Saturday, Dec. 22 and will reopen Wednesday, Jan. 2, 2019. Visit http://www.moreheadstate.edu/recreation for hours from Dec. 10-21. Camden-Carroll Library: The library will be closed Dec. 8-9, Dec. 15-16 and Dec. 19 to Jan. 2, 2019. It will be open Dec. 10-14 and Dec. 17-18 from 8 a.m. to 4:30 p.m.
Kentucky Folk Art Center (KFAC): KFAC will be closed Saturday, Dec. 8 and Dec. 24-Jan. 2. It will be open Dec. 10-14 and Dec. 17-22 from 10 a.m. to 2 p.m. It will be open on Saturday, Dec. 15 and Saturday, Dec. 22 from 9 a.m. to 5 p.m.
University Post Office: The post office will operate under normal business hours Dec. 10-18. The service window will be open from 9 a.m. to noon on Dec. 21, Dec. 26 and Dec. 28 for mail and package pickups only. University Store: The University Store will be open regular hours from Dec. 10-17 and will have limited hours on Dec. 18. The store will be closed Dec. 19 to Jan. 2, 2019. Call 606-783-2081 for more information. The MSU Police Department will be available at 606-783-2035 to answer questions and address campus concerns throughout the break.